A veteran four-piece unit based out of Louisville, Ky., Laurie Jane & The 45s are an interesting band who meld the sounds of big-city blues from the ‘50s with jazz and high-energy rockabilly and soul into a package that’s totally their own. They’re fronted by vocalist Laurie Jane Duggins, a powerful, full-throated alto who spent her early career in musical theater, influenced by several classic singers, including Ella Fitzgerald, Etta James and Rosemary Clooney. Her life and musical stylings evolved after meeting rockabilly guitarist, lap steel and keyboard player and future husband Cort Duggins. Cort had been working in a trio with upright bassist Jason Embry and percussionist Scott Dugdale for the better part of two decades. When that act appeared to run its course, he and Laurie decided to create the 45s, and Embry and Dugdale quickly rejoined forces. Midnight Jubilee is a follow-up to the band’s self-titled 2015 release. It consists of eight originals and three covers and was produced and recorded by former Stevie Ray Vaughan guitar tech Steve “Catfish” Wilson at his Raise The Roof studio in Louisville. An instrumental introduction from Cort kicks off the medium-fast opener, “Wait So Long,” before Laurie Jane’s velvety voice tinged with the slightest of Southern accents joins the action as she eagerly woos a potential lover after being solo for quite some time. Her husband’s rockabilly roots shine through in a brief mid-tune solo, and the tight rhythm section is prominent in the mix. The action slows slightly for the bittersweet blues shuffle “Lucky Boy,” a ballad that reminds a former lover of the good fortune he enjoyed after meeting his lady so long ago as he points out the suffering he’s endured since she let him go. The title tune, “Midnight Jubilee,” is a syncopated ode to a lover who lights up the night. 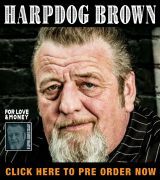 It precedes an interesting, uptempo cover of “Howlin’ For My Darlin’,” the Willie Dixon-penned Howlin’ Wolf standard. The loping rocker “Fine By Me” and the percussive “Down This Road” both deal with the end of romances while “It’s Been A Long Time,” a cover tune written by Howard Biggs and Jelly Roll Morton saxophonist Joe Thomas, addresses love from the other side. A ballad that gives Cort space to shine with a pair of extended single-note solos, it’s delivered from the position of a woman who longs for a man who’s not been at her side for quite a while. Cort’s on lap steel as Laurie Jane launches into the countrified ballad, “Couldn’t Cry Alone,” before the medium-fast shuffle “Got Me Where You Want Me,” the final cover in the set. A military beat and unhurried guitar solo introduces “What’s A Girl To Do,” another song of longing, before the uptempo rocker “Not With You” brings the action to a close. 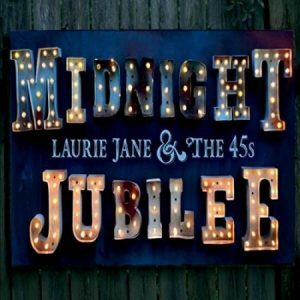 Available through CDBaby, Midnight Jubilee is a solid offering for a band that’s a local favorite with a regional following. 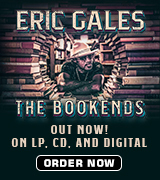 If you like your blues delivered with a Southern rock feel, this one’s for you.